The White House and Senate Judiciary Committee chairman Chuck Grassley (R., Iowa) are continuing to give their full backing to Supreme Court nominee Brett Kavanaugh following an accusation of sexual assault against him. 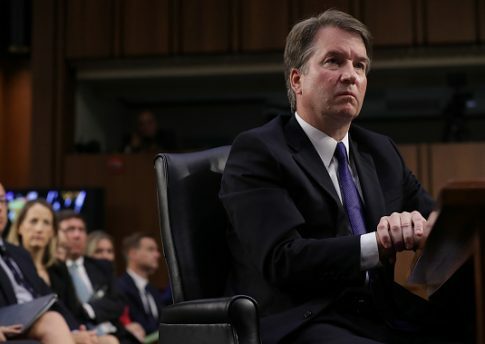 It stems from an alleged incident 35 years ago when Kavanaugh was likely a junior in high school, though his accuser said she could not be sure of the precise year or location of the alleged attack. California professor Christine Blasey Ford told the Washington Post Kavanaugh attacked her when they were at a party in Maryland in the early 1980s, alleging he forced her into bed, groped her, and tried to remove her clothes while he was heavily intoxicated, all while his friend watched. She said she managed to escape after the friend, Mark Judge, jumped on them, sending them tumbling and giving her an opportunity to get out of the room. Kavanaugh said he "categorically" denied the accusation, and Judge said the story is "absolutely nuts." The two were classmates at prestigious Georgetown Preparatory School. Grassley ripped ranking committee Democrat Dianne Feinstein (D., Calif.) for sitting on the story—she was first made aware of the charge in a letter from Ford in July—and said if Democrats took it seriously, it should have been brought to his attention "much earlier." Feinstein first sent a cryptic statement about the accusation last week before the New Yorker reported Friday on the lurid details of the charge. Ford then emerged to tell the Washington Post she was the accuser, saying she was afraid her story would get twisted by others. It was "disturbing," Grassley said, that such accusations would come forward before the scheduled committee vote on Kavanaugh Sept. 20. "Instead, they said nothing during two joint phone calls with the nominee in August, four days of lengthy public hearings, a closed session for all committee members with the nominee where sensitive topics can be discussed and in more than 1,300 written questions," Grassley said. "Sixty-five senators met individually with Judge Kavanaugh during a nearly two-month period before the hearing began, yet Feinstein didn't share this with her colleagues ahead of many of those discussions." Grassley went on to say it raised a lot of questions about the "Democrats' tactics and motives" and encouraged Feinstein to release the letter she got in July from Ford. He also linked to testimonials about Kavanaugh's "impeccable character" and respect for women. While Senate Democrats are again calling on Kavanaugh's vote to be delayed, the White House is also standing behind Kavanaugh, whom President Donald Trump tapped in July to replace the retiring Justice Anthony Kennedy. The 11th-hour charge rocked the confirmation process for Kavanaugh, who had appeared headed for a successful vote for weeks. Progressives have mounted a furious bid ever since his nomination in July to derail him, but thus far, no Senate Republicans have indicated they will vote against his confirmation. Democrats need to flip at least two Republicans to block Kavanaugh. Ford said she told no one about the alleged attack until 2012, when she was in couples counseling with her husband. The therapist's notes, which were reviewed by the Washington Post, didn't mention Kavanaugh's name but did say she was attacked by students "from an elitist boys’ school" who went on to become "highly respected and high-ranking members of society in Washington." Her husband, Russell Ford, said she spoke of being trapped in a room with two drunken boys. He also said she mentioned Kavanaugh's name and voiced concern he might one day ascend to the Supreme Court—he was a D.C. Circuit Court judge at the time. Ford also said the attack caused her lasting psychological trauma. Ford is a registered Democrat with a record of contributing to Democratic politicians. She tapped progressive Washington attorney Debra Katz, known for her work with #MeToo accusers, to represent her following her decision to go public. Katz attacked Paula Jones repeatedly in 1998 when she claimed Bill Clinton had sexually harassed her when he was the governor of Arkansas. Katz said Jones' lawsuit would have been dismissed if Clinton weren't the President of the United States, and she also said Jones' claims were "very, very weak" and had a "complete lack of proof." Clinton eventually settled the lawsuit with Jones for $850,000. Katz is also a committed "Resistance" member opposed to the Trump administration, she told the University of Wisconsin alumni magazine, and she has donated more than $26,000 to Democratic politicians and liberal groups. This entry was posted in Politics and tagged Brett Kavanaugh, Chuck Grassley, Senate Democrats, Sexual Harassment, Supreme Court. Bookmark the permalink.